Aircraft Repair Company Trencin – LOTN are prepared to deliver the next Mi-17 helicopter to the Afghan Air Force after a general overhaul. The helicopter was repaired by the company on the basis of a contract with the NSPA (NATO Support and Procurement Agency) won in 2016 in public tender. “Despite the existence of sanctions imposed on the Russian Federation, while still operating in full compliance with all applicable international and national regulations, LOTN is continuing to support the highly-prized general repairs of the Mi-17 helicopters for its customers. This series of helicopter repairs are the result of the highly professional work ethic and determination of our company," said CEO and Chairman of the Board LOTN JUDr. Martin Dušanič. He was also complimented by the Minister of Defense of the Slovak Republic, Peter Gajdoš, who visited a state-owned joint stock company in Trencin to personally see for himself how the contract between LOTN and NSPA was being fulfilled. "I can assume that the work is in full compliance with the contract. Therefore, I want to highlight the expertise and professionalism of all employees of LOTN. They confirm that Slovakia has truly excellent experts, which make our companies competitive and they can also apply in an international environment," emphasized Defense Minister Peter Gajdoš regarding LOTN’s fulfilment of their obligations. General repairs of Russian Mi-17 helicopters are a decades-long production program of LOTN. Collaboration with Russian manufacturing companies and MVZ Milja, an author-design organisation, has been instrumental in harnessing Slovak labor forces as well as supporting and preserving brands of high-quality helicopters that are still used around the world. 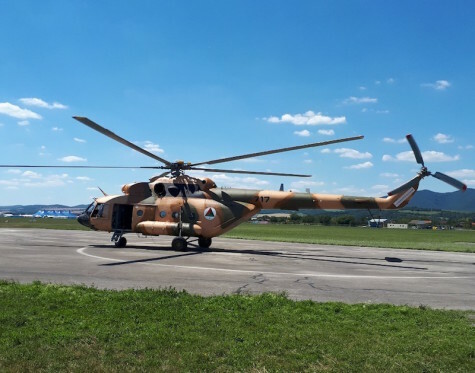 LOTN received a contract for general repairs of helicopters Mi-17V-5 as early as 2016, thanks to their success in the NSPA international public competition. -- March 04, 2019 @ 16:30 CET: Corrected photo caption to reflect company is based in Slovakia.